We’d love your help. Let us know what’s wrong with this preview of Beyond Our Selves by Catherine Marshall. To ask other readers questions about Beyond Our Selves, please sign up. I find Catherine's books remarkable. They opened my eyes to a deeper level of relationship we can have with the Lord. I finish her books with new insights & a hunger for even more of God in my heart & life. Along with AJ Cronin's The Keys of the Kingdom, this book had the greatest impact on my spiritual outlook as a young girl. I'd have to reread it to say for sure, but it was my first encounter with religious ideas applied to real life situations, and an author more interested in every day moments instead of "top of the mountain" revelations. Just read that Marshall died in 1983, about a year before I started reading her. Mom's bookshelf was limited to mostly Catholic authors like Fulton Sheen; how Along with AJ Cronin's The Keys of the Kingdom, this book had the greatest impact on my spiritual outlook as a young girl. I'd have to reread it to say for sure, but it was my first encounter with religious ideas applied to real life situations, and an author more interested in every day moments instead of "top of the mountain" revelations. For a while now, I've been interested in reading Catherine Marshall, simply because I know that Richard Foster respects her very highly, and I respect Foster. I found this book, Beyond Our Selves, from 1961, on a giveaway shelf, and I've been reading bits of it here and there in my office over the past several months. There is a lot of great content here on learning to depend on God and trust him for everything. These lessons will never get old, because I never seem to learn them very well. The t For a while now, I've been interested in reading Catherine Marshall, simply because I know that Richard Foster respects her very highly, and I respect Foster. I found this book, Beyond Our Selves, from 1961, on a giveaway shelf, and I've been reading bits of it here and there in my office over the past several months. There is a lot of great content here on learning to depend on God and trust him for everything. These lessons will never get old, because I never seem to learn them very well. The teaching is couched in stories, mostly of friends of Marshall's, or of Marshall's own life or her late husband's, Peter Marshall (whom she almost always calls by his full name, "Peter Marshall," whenever she refers to him). Some of this was really, really good. Some I'm not sure about and would have to think through. Sometimes she'll make a claim that sounds outlandish but later in the chapter will qualify it. Some sounded formulaic but she does seem to have a good grasp of walking with Christ. If you don't mind her (slightly flowery, wordy) writing style this may be worth sifting through. This is my 2nd time thorugh this book. I read it about 10 yrs ago and find it as refreshing again today. Catherine Marshall is such an indepth and willing "sharer" of her life and her emotions. Her book/movie A Man Called Peter is riveting. This is an oldie but goodie! It's been a while since I read this. I just remember how insightful it was. It really made me think about my walk with God. I loved it. Catherine Marshall, author of the Christy books and a devout Christian, was married to Peter Marshall, former Chaplain of the U.S. Senate until his death in 1949. It was after her husband's death that Ms. Marshall began to write, beginning with a compilation and editing of several of Dr. Marshall's sermons and prayers, which became a bestseller. The novel, A Man Called Peter, a biograpy of Dr. Peter Marshall, written by Ms. Marshall was published in 1951, and very quickly became a bestseller as Catherine Marshall, author of the Christy books and a devout Christian, was married to Peter Marshall, former Chaplain of the U.S. Senate until his death in 1949. It was after her husband's death that Ms. Marshall began to write, beginning with a compilation and editing of several of Dr. Marshall's sermons and prayers, which became a bestseller. The novel, A Man Called Peter, a biograpy of Dr. Peter Marshall, written by Ms. Marshall was published in 1951, and very quickly became a bestseller as well. In 1959, Ms. Marshall married Leonard Earl LeSourd, executive editor of Guideposts Magazine. The couple remained together until Ms. Marshall's death in 1983. Catherine Marshall's novel, Beyond Our Selves, was written after her diagnosis, confinement while suffering, and recovery of tuberculosis. During the years of Ms. Marshall's confinement, many spiritual questions emerged as she was forced to spend hour after hour, day after day, year after year, alone with only her thoughts to keep her company. In Beyond Our Selves, Ms. Marshall, in unreserved transparency, reveals those spiritual questions and the answers she found through study of Scripture, personal prayer and meditation, and sheer desire to know Him as she is known by Him. Her chapters, i.e. "How to Enter In;" "Dare to Trust God;" "The Prayer of Relinquishment;" "Journey Into Joy;" and; "Afterglow," help to shine a light on the content of this book. Ms. Marshall, in Beyond Our Selves, reveals herself as part mystic, scientist, skeptic, teacher, and, above all, seeker as she shares with the reader what she discovered in her serious effort to enter in. I highly recommend this book to those who desire the deeper knowledge that is the key that opens the door to a life with Him that is other-worldly, that is beyond ourselves. 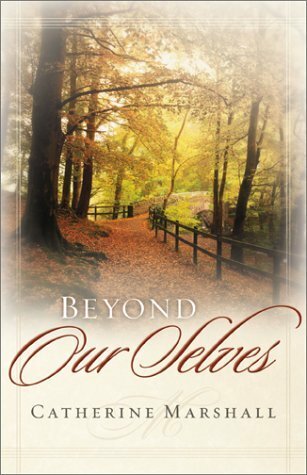 ‘Beyond Ourselves’ is semi-biographical, charting the author’s spiritual journey. It’s one of the most inspiring and encouraging books I’ve ever read. In the first chapter, she asks if her readers are satisfied with who they are and what they have. She recounts anecdotes from her own life and that of several people she has met or corresponded with, who realised that their lives were somewhat empty but did not know how to change anything. The rest of the book charts her own discoveries, and sugge ‘Beyond Ourselves’ is semi-biographical, charting the author’s spiritual journey. It’s one of the most inspiring and encouraging books I’ve ever read. In the first chapter, she asks if her readers are satisfied with who they are and what they have. She recounts anecdotes from her own life and that of several people she has met or corresponded with, who realised that their lives were somewhat empty but did not know how to change anything. The rest of the book charts her own discoveries, and suggests ways in which people can involve God in their lives in new and often exciting ways. Different chapters deal with surrendering the ego, looking for guidance, forgiving others, seeking prayer for healing, and much more. We chose this book for our church book club. My first impression was that the book was a bit preachy, but I found that it grew on me. Marshall writes well and gives interesting examples of spiritual concepts she has come to believe through experience. She sounds authentic and much of her experience agreed with my own. I intend to read the book again and use it for meditation and personal growth. This book was an absolutely inspiring read. If you want to understand more about how the "giving up of self" and the "finding more of Christ" is supposed to look in the Christian life, pick this up! I was impressed with Marshall's accessible writing, her heart for people, her own story and the stories of others she's met, and overall for her amazing observations of the Christian journey of growth. I was blessed by the read. I came upon this old book while on vacation and recognized the author, so I read it. Although written in the 1960s, it is amazingly relevant for today. A thought-provoking read for. anyone looking for "more" out of life. This book changed my life. I was struggling with fear, anxiety and insomnia. Catherine Marshall took me on a journey of deeper faith with God and no coincidence she struggled with insomnia too. i have read all her books and I can honestly say her writing has drawn me closer to God. One of the best books on the Holy Spirit that I've read. Catherine Marshall combines teaching about the Holy Spirit with examples of the Holy Spirit touching people's lives throughout the book. God used this book to change my life. It is wonderful. Great insights for women who are new believers in Christ. I loved this book! I read it at just the right time I needed to read it. I love it when that happens. I read this book this year, shows how much Catherine grew after marrying Peter. This book has impacted me greatly. Will be rereading it continuously throughout my life. It is currently out of print, but found some used copies on Amazon. I will giving these as gifts for sure. What a wonderful spiritual journey Catherine takes one on. Loved the book. My mother recommended it --loved it! This lady certainly has faith and depicts it wonderfully. Would recommend it to anyone questioning the power of prayer. This book will go into my stash to put into the church library. This book was loaned to me by a church friend, a woman several decades older than me. I found it so neat that this book, written in a different era, still felt applicable to me today. There were chapters/subjects I found more impactful than others, but overall this book did a great job of opening my eyes to parts of my faith I hadn’t considered or fully explored before. I even found myself talking about certain passages to others! I’m ready to dig deeper now! This is a reread, a book that was given to me forty years ago, and still has the power to speak into my life. Yes it's old fashioned in some ways but letting this delightful woman tell you some home truths is unique and special. Now to find the other books from her !! Written many years ago by famed author Catherine Marshall. Story of her journey in faith. Marshall was born in Johnson City, Tennessee. She was the daughter of the Reverend John Ambrose Wood and Leonora Whitaker Wood. From the age of nine until her graduation from high school, Marshall was raised in Keyser, West Virginia, where her father served as pastor of a Presbyterian church from 1924 to 1942. While a junior at Agnes Scott College, she met Peter Marshall, marrying hi Marshall was born in Johnson City, Tennessee. She was the daughter of the Reverend John Ambrose Wood and Leonora Whitaker Wood. From the age of nine until her graduation from high school, Marshall was raised in Keyser, West Virginia, where her father served as pastor of a Presbyterian church from 1924 to 1942. While a junior at Agnes Scott College, she met Peter Marshall, marrying him in 1936. The couple moved to Washington, DC, where her husband served as pastor of the New York Avenue Presbyterian Church and Chaplain of the United States Senate. In 1940, Marshall contracted tuberculosis, for which at that time there was no antibiotic treatment. She spent nearly three years recovering from the illness. Her husband died in 1949 of a heart attack, leaving her to care for their 9-year-old son, Peter John Marshall. He later also became a minister and author. Marshall wrote a biography of her husband, A Man Called Peter, published in 1951. It became a nationwide success and was adapted as a film of the same name, released in 1955. Her success encouraged her to keep writing. In 1959, Marshall married Leonard LeSourd, who was the editor of Guideposts Magazine for 28 years. Together they founded a book imprint, Chosen Books. They had three children, Linda, Chester and Jeffery.